Editor’s Note I: Emma Latham is a Princeton University junior who is interning at Eagle Rock for the summer. Emma is here as part of the Princeton Internships in Civic Service (PICS), which was established by the Princeton University Class of 1969 in the belief that community service is essential to the welfare of society. More than 800 Princeton University undergraduates have participated in PICS since its inception, with 10 or so interning at Eagle Rock since Eagle Rock’s founding in the early 1990s. Below is Emma’s take on her experiences so far at Eagle Rock — and some advice for those who want to become Eagle Rock School and Professional Development Center interns. I’m Emma, the summer intern from Jersey City, N.J., and I arrived on the Eagle Rock campus in mid-June. Following this trimester, I’ll be returning to Princeton University for my junior year. I am an ecology major — which means you can often find me on Rick’s Trail, crouched in the shrubs trying to identify a wild flower. Or that’ll be me with my face buried in a pine tree observing a trail of ants. 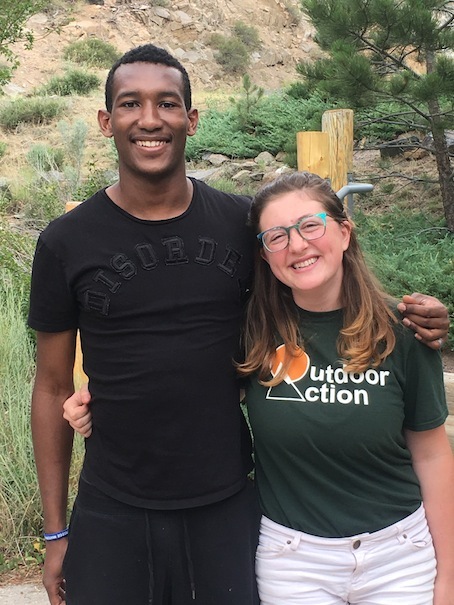 Eagle Rock School student Djibril Cayolbah with Eagle Rock Summer Intern Emma Latham. I ended up at Eagle Rock because I wanted to work in an alternative schooling environment that addressed the vast inequalities and injustices of our American education system. I saw how Eagle Rock students were able to engage academically through projects and experiential learning, and this approach to education deeply resonated with me. I was also blown away by Eagle Rock’s 8+5=10 philosophy, which doesn’t just focus on academic achievement, but on self-improvement and engagement with the greater community. The core elements of 8+5=10 mirrored my personal code of ethics and what I strive for in college. Eagle Rock also seemed like a perfect fit because I wanted to live in a residential community. I wanted a place where I could have the time to build deeper connections with students. What this means to me is that I get to eat breakfast with the students, have four-square tournaments in between classes, and then hang out after dinner and watch movies with them. One of my main roles while I am here is to offer evening activities for the students. These have included lessons on pottery wheel, ice-cream bowling, and Bingo Night. And of course, playing hours of the board game Dominion. I am also assisting with the Colorado Rocks class, which has been a great opportunity to hone my teaching skills. By going to classes I have been able to observe different teaching styles and put them into practice by leading short lessons. This role has been especially fulfilling since I’m interested in teaching high school biology after I graduate from college. As an outdoor orientation leader at Princeton, I’m also interested in outdoor science education, and would love to teach science in a wilderness or farming context. So creating lesson plans implemented on geological formations like Devil’s Backbone has been a blast! First off, just go ahead and jump right in. Everything is constantly changing at Eagle Rock — from the dynamics of the student body to the classes offered. And these students are more than willing to embrace you as a part of the community as long as you put yourself out there. Sometimes an activity or an interaction might flop, but if you continue to be open and present, maybe the next one won’t. Also, attend classes every chance you get. Classroom participation can be entertaining and unexpected, whether you want to teach, participate or just sit back. Finally, take some time alone in order to re-center and reflect. Living on the Eagle Rock campus means you are constantly surrounded by the high-energy atmosphere and the consistent chattering of high schoolers. So some time off by yourself — while a rarity — is absolutely essential. For myself, I have enjoyed hiking in the hillsides around campus, and I’ve come to appreciate the peaceful vistas at the top of cliffs as private areas to journal and decompress. Editor’s Note II: If you’re interested in having an experience like Emma’s, please inquire about becoming an Eagle Rock School and Professional Development Center intern (warning: clicking on link opens a PDF file). This entry was posted in Meet The Team and tagged Djibril Cayolbah, Eagle Rock Interns, Emma Latham, PICS, Princeton Internships in Civic Service.